reference links to biographies and books about his life and work. 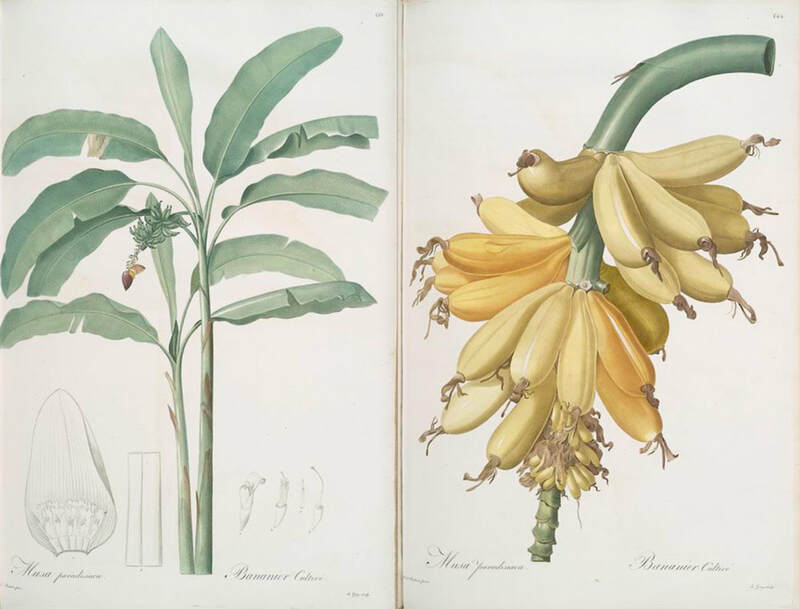 Pierre-Joseph Redouté was one of the most talented botanical artists ever known. 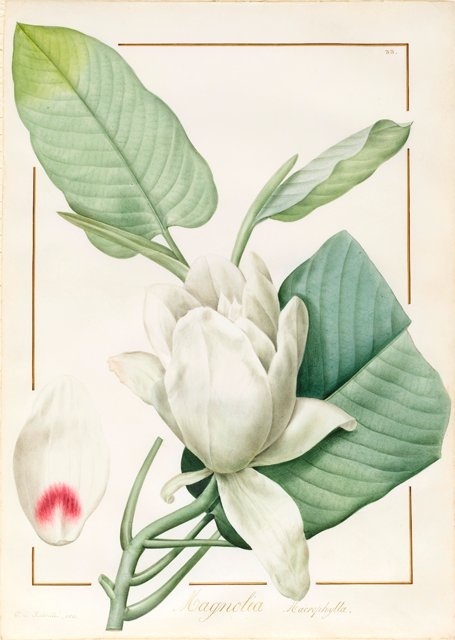 He is also possibly the most popular botanical artist in history. Many people first become interested in botanical art after seeing reproductions of his paintings of roses, lilies and other flowers. He was born in 1759 in what is now Belgium and died in June 1840. Redouté was fortunate to become an artist who was patronized by the kings of France from Louis XVI to Louis-Philippe. ​His profile also has a unique claim to fame. His status and reputation was enhanced in no small way due to his patronage by two of the premier first ladies of European history - Marie Antoinette and Josephine Bonaparte. 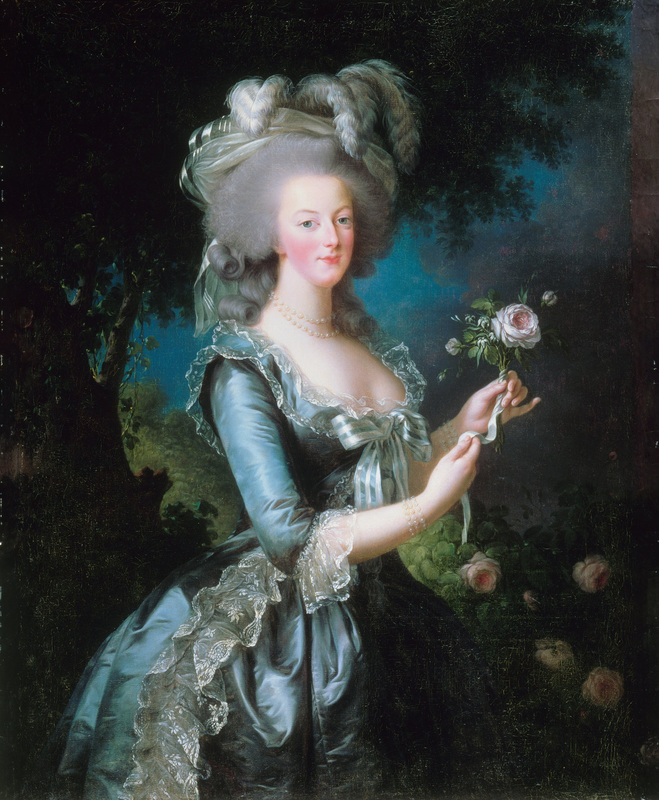 he was art tutor to Marie Antoinette (the last Queen of France) and she became his patron. Redouté received the title of "Draughtsman and Painter to the Queen's Cabinet". in 1798 The Empress Josephine Bonaparte, the first wife of Napoleon Bonaparte, also became his patron and appointed him to paint the flowers of the garden at Malmaison. Les Liliacees (1802 - 15) 500 plates of lilies. Les Roses (1817 - 21) He's best known for his roses. His series of rose paintings are his finest work. His work continues to be popular and is widely reproduced. 1759 - Born July 10, 1759 in St. Hubert, Ardennes, Belgium. Redouté is Belgian (not French), even though he lived for most of his life in France. He was the second son in his family and was born into a long line of Belgian painters. His father taught him to paint and by the age of 6 young Pierre-Joseph was producing small paintings. Age 13, he left home to earn his living as an artist. He then spent the next 10 years living a precarious life as an itinerant painter. He travelled across Flanders and the Low Countries and studied the paintings of the Flemish Masters when and where he could. 1782 - Age 23, he joined his elder brother in Paris to work as a stage-set designer for the new Theatre Italien. He devoted his time off to a developing interest in painting flowers. He was also given instruction in the technique of colour-printing. He also attended lectures by Gerard van Spaendonck, a Dutch painter and the official Royal Professor of Painting for the French court. ​He sought rare plants to draw and drew the many unusual plants in the glasshouses of Le Jardin de Roi - The Royal Garden of Medicinal Plants - now known as the Jardin des Plantes. A record - and archive - of all plants brought to the garden was made through drawings and paintings - now known as Collection des Vélins (The Collection of Vellum). Today it contains nearly 7,000 gouaches and watercolors on vellum representing flowers, plants and animals. 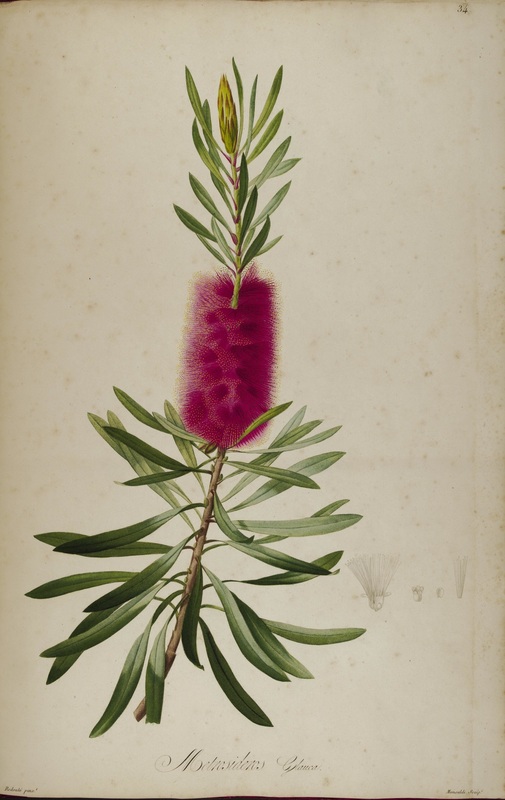 He taught Redouté about plant anatomy, the dissection of flowers and their scientific representation - and what botanists required of illustrations. created the drawings for plates for a new publication called Sertum Anglicum (An English Garland) by L'Heritier. This is a study of the rare plants growing at Kew. This was published in 1788. In total he created over 500 drawing for L'Heritier. 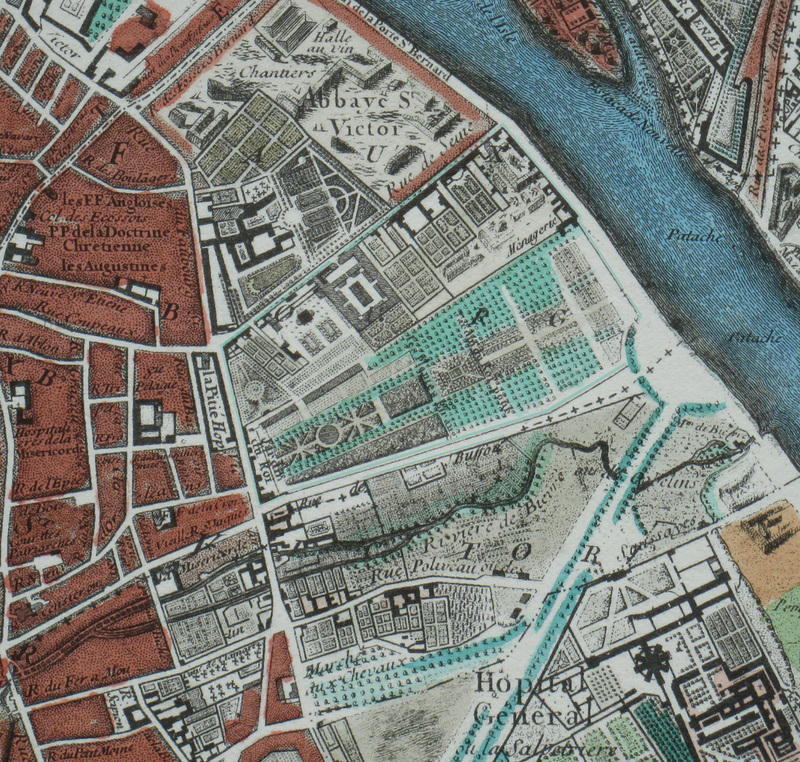 Redouté was fortunate to be living in Paris at the very end of le Siècle des Lumières (the Age of Enlightenment 1715-1789) when the city was a centre for both science and culture. Spaendonck by this date was painting in pure watercolour on vellum. He taught Redouté the technique of painting on vellum and in 1875, Redouté produced several works for the famous Vélins du Roi under Spaendonck’s direction. By his own account, his student's work was finer than his own. 1792 - He was employed by the French Academy of Sciences. 1793 - Pierre-Joseph won (with his brother and another artist) a competition held by the Museum of Natural History to select artists for the museum. It was also decided that he would continue the botanical illustrations for the Vélins de Roi. 1798 - The Empress Josephine Bonaparte, the first wife of Napoleon Bonaparte, also became his patron and appointed him to paint the flowers of the garden at the Chateau de Malmaison. 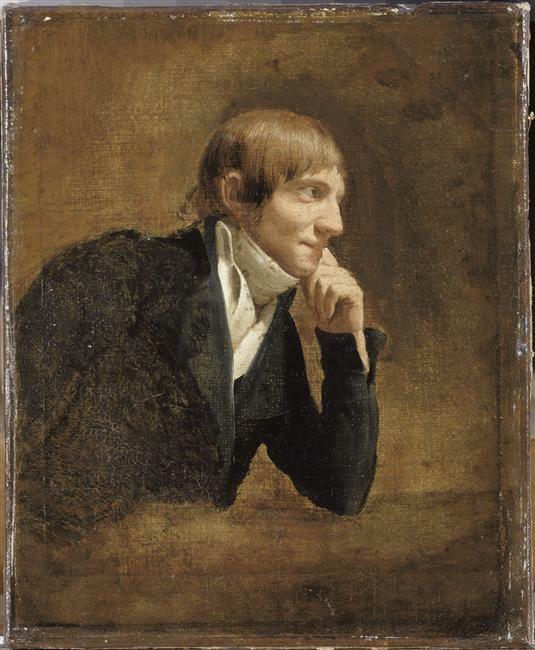 1819 - Redouté's artworks were exhibited at the Louvre. 1822 - He became an art teacher and in later life he was impoverished due to his earlier spending habits when he earned good money. 1828 - John James Audubon (born Jean Rabin in Haiti), the famous ornithological artist visited Redouté in his studio and showed him he first parts of Birds of America. Audubon commented in his journal that Redouté had told him he received as much as 250 guineas for a single painting. 1839 - age 80, he began planning a a significant artwork but never realised it. 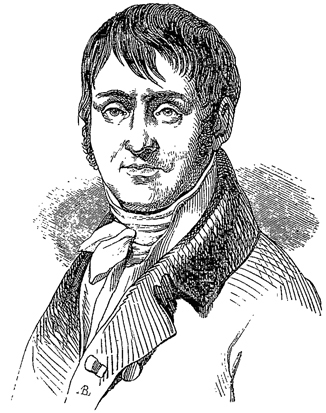 ​1840 - Died suddenly age 80 on 19 June 1840, Paris. His grave can be found in Père Lachaise Cemetery in Paris. .....the last twenty years of his life are punctuated by disappointments: professional appointments that do not happen, books that sell less well, a clientele already largely satisfied by its successive editions and a taste of the public that evolves. His financial situation became more precarious, especially since the investments he had made in his domain at Fleury had cost him dearly. An indefatigable painter, Pierre-Joseph Redouté died on June 19, 1840 of a cerebral congestion on his work table, certainly famous but poor. January 14, 1825 - King Charles X honored Pierre-Joseph as a Chevalier de la Légion d'honneur. 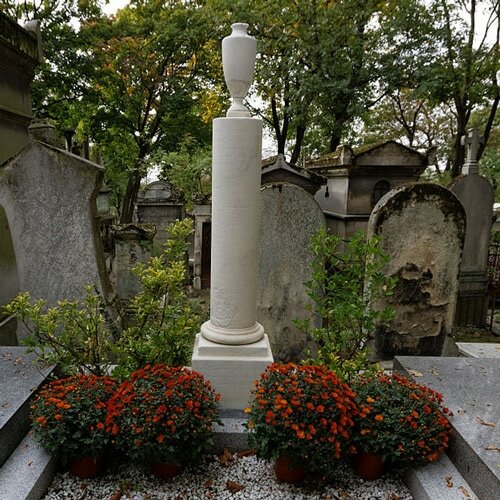 Tomb of Pierre-Joseph Redouté (1759-1840) at Père Lachaise Cemetery in Paris. Musée Pierre-Joseph Redouté - a museum about Redouté in his home town. 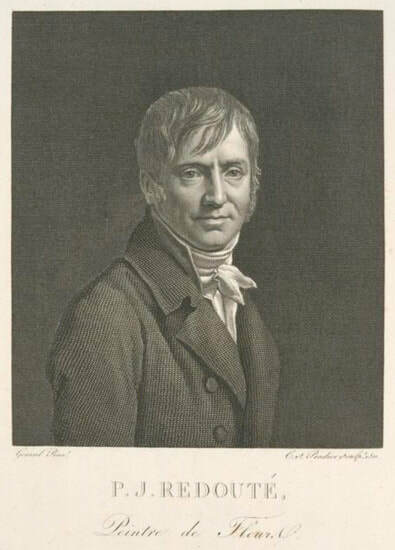 Redoute, Pierre-Joseph (1759-1840) - Biographical sketch of a Botanical artist, illustrator and engraver. Pierre Joseph Redoute 1759 -1840, P.J. Redoute - Pierre Joseph Redouté (1759-1840) illustrated approximately 50 botanical books during his lifetime making him one of the most prolific and widely celebrated botanical artists of the 18th and 19th centuries. 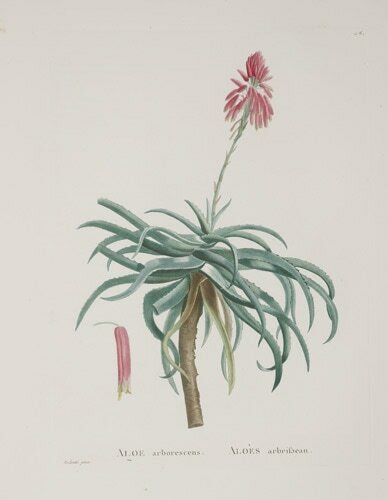 This section will develop information about the approach and techniques used by Redouté when developing his botanical paintings and engravings. paintings were subsequently reproduced for publication using copperplate stipple engraving. Redouté is one of a few botanical artists who mastered both painting in watercolour and line and stipple engraving. Redouté's technique, modelled upon that of van Spaendonck, involved "pure water colour, gradated with infinite subtlety and very occasionally touched with body-colour to suggest sheen"
Redouté eventually perfected the reproduction of his paintings for publication using stipple engraving, which used dots, rather than lines, to engrave plates, with varying dot density being used to convey tone and shading (Blunt 1967). ​This is probably the classic book about flowers painted by Pierre Joseph Redouté. ​The book includes Redouté's preface to the original edition plus a 12 page introduction by William Stearn about the life and work of Redouté. Every plate is accompanied by a narrative which traces the origin and history of the plant and discussing its horticulture today. 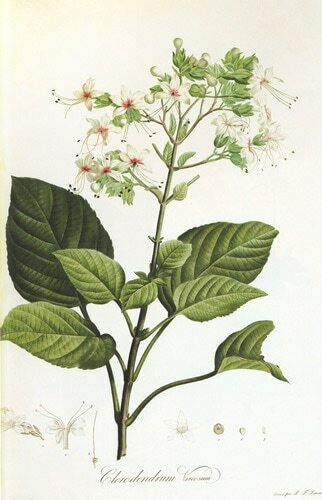 All but 5 of the 144 color plates are reproduced from the original engravings in The British Museum Botany Library's copy of Redouté's Choix des plus belles fleurs prises dans différentes familles du règne végétale et de quelques branches des plus beaux fruits groupée quelquefois et souvent animéee par des insectes et des papillons (Paris, 1827). the galleries of dealers in vintage botanical art prints i.e. the original engravings. 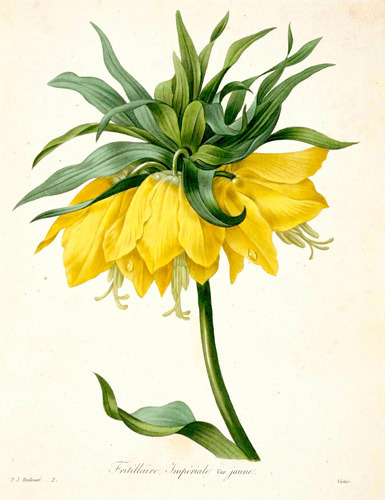 Redouté continues to be one of the most popular botanical artists from the past. It's not impossible to aspire to own an 'original' Redouté so long as you understand that what you can aspire to is an original engraving rather than the actual watercolour. ORIGINAL PUBLICATION: Pierre Joseph Redouté. From Les Liliaces. Paris, 1802-16. Folio, 14 x 21 1/2. Stipple engravings, printed in color, and finished by hand. 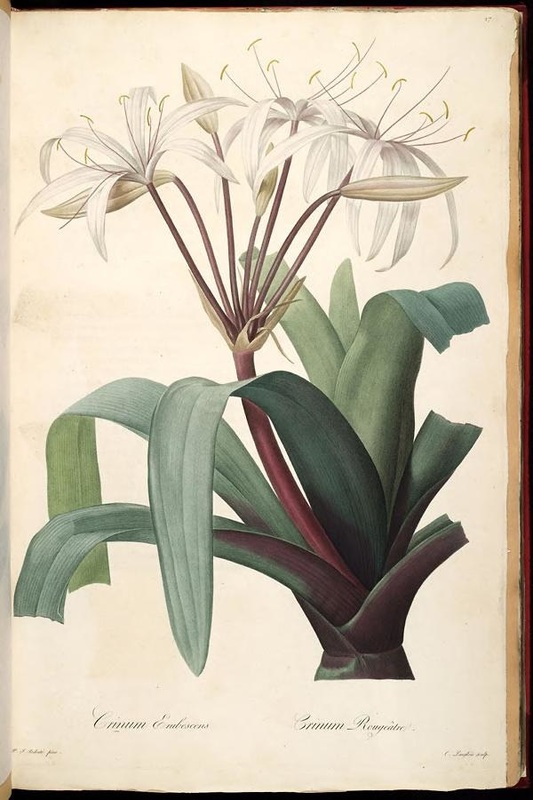 The Empress Josephine's copy of Pierre-Joseph Redoute's botanical watercolors for his book ''Les Liliacees,'' (''The Lilies'') was auctioned yesterday at Sotheby's for $5.5 million to W. Graham Arader, a rare-book and print dealer, who organized a syndicate to make the purchase. The book of 468 watercolors on vellum depicts flowers in the gardens of Malmaison, St.-Cloud, Versailles and Sevres. It was made between 1802 and 1816, and comprises 16 volumes weighing a total of 320 pounds. The sale lasted only three minutes, one of the fastest ever for such an expensive property, and the price achieved was the 10th highest for a work purchased at an art auction house. This oversized hardback by Taschen has appreciated in price since publication - such is the love of botanical art lovers around the world. New copies typically now sell for well for in excess of £/$100. Second hand copies cost less and will vary in price relative to condition and who's selling. After the Revolution, Redouté's post of official artist was transferred to the French Natural History Museum where he prepared illustrations for scientific publications. This involved developing botanical art for the Empress Josephine as part of her project to develop and document the gardens at Malmaison. Description des plantes rares cultivees a Malmaison et a Navarre is a Description of rare plants cultivated in Malmaison and Navarre. 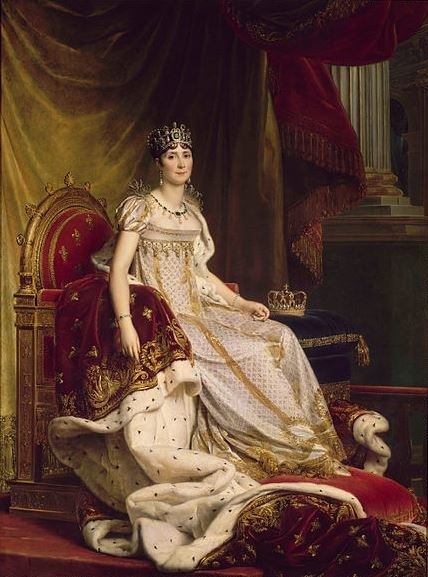 The book was written by Aimé Bonpland and dedicated to the Empress Josephine. Bonpland was a French explorer and botanist who had travelled to South America (Venezuela, Cuba, New Granada, Peru, Mexico between 1799-1804). The book comprised 157 pages and 64 coloured plates by Redouté (published in 11 parts). Copies of ​Description des plantes rares cultivees a Malmaison et a Navarre are very rare and don't come up for auction very often. 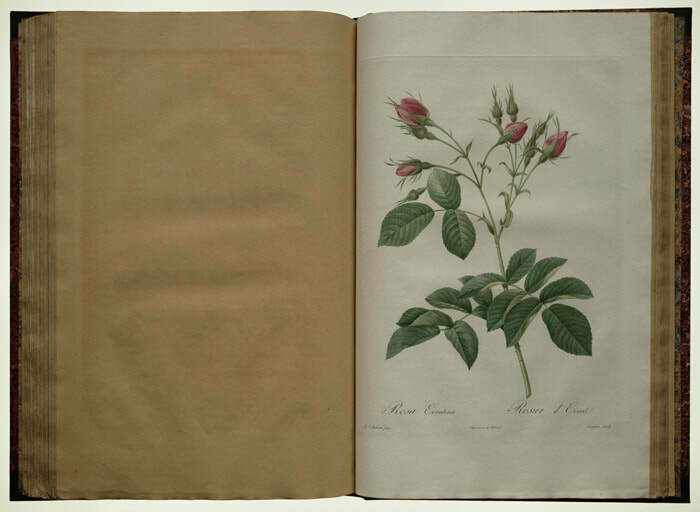 Les Roses comprised three volumes of Les Roses and 168 unnumbered folio plates. It was published in 30 instalments over seven years between 1817 and 1824. These were done at the height of Redouté's career and were published just after he had finished his Les Liliaces. ​Les Roses achieved even greater fame than the previous series. 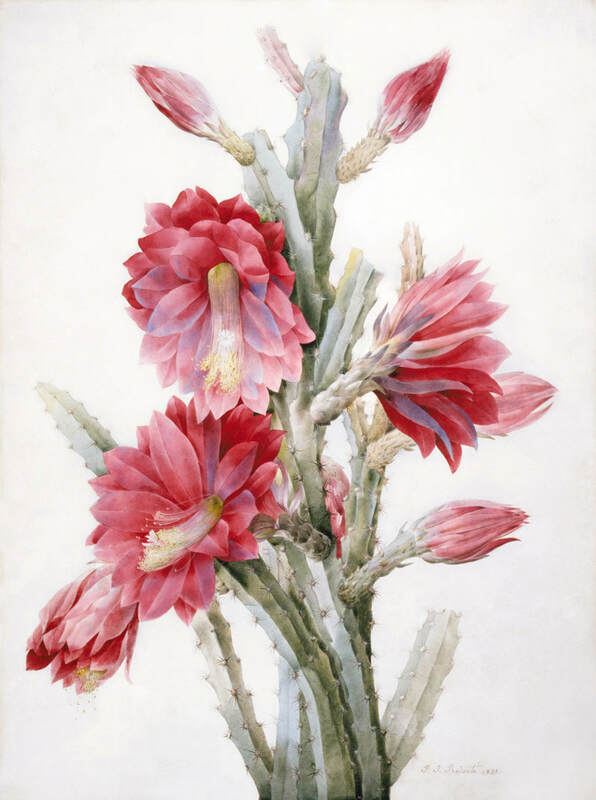 They are said to be the flower paintings (of any botanical artist) which are most often reproduced. Edition in the Library of Congress, Washington D.C.
Les roses | New York Public Library Digital Collections - an excellent reproduction of the illustrations in the book which allows download of the images. The original was published in three volumes between 1817 and 1824. ​Taschen decided to celebrate its 25th anniversary by republishing a set of some iconic publications - and chose "The Roses" by Redoute to be one of those publications. 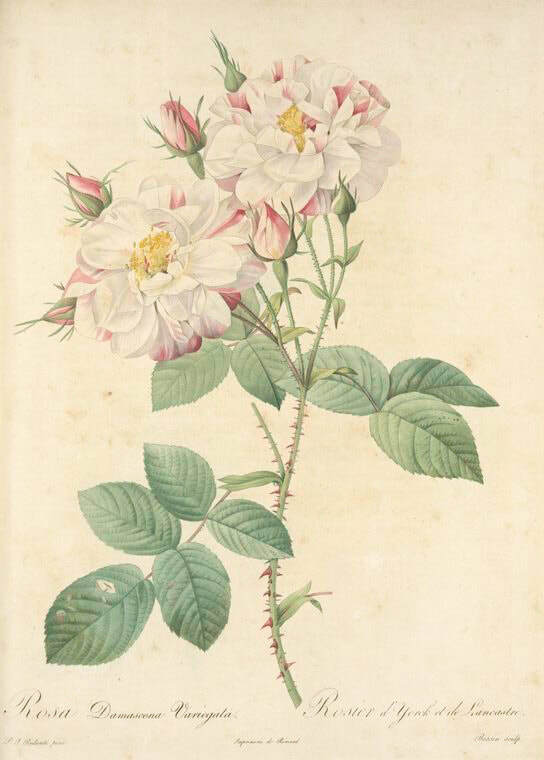 This is a faithful reproduction of Redoute's most celebrated work "Les Roses". The category Pierre-Joseph Redouté, North American Sylva illustrations contains illustrations attributed to Pierre-Joseph Redouté (1759 – 1840) in François André Michaux's The North American Sylva. Other illustrations in that 3-volume work are attributed to his brother Henri-Joseph Redouté (1766 – 1852) and to his student Pancrace Bessa (1772 – 1846). Plate 58 from The North American Sylva: Gordonia lasianthus - loblolly-bay. There are 187 plates in the copy in the Library at Kew with accompanying text. A number of ​Redouté's original paintings are watercolour on vellum. Many are considered to be his greatest works. However most of the images we see tend to be engravings due to their publication for wider distribution. 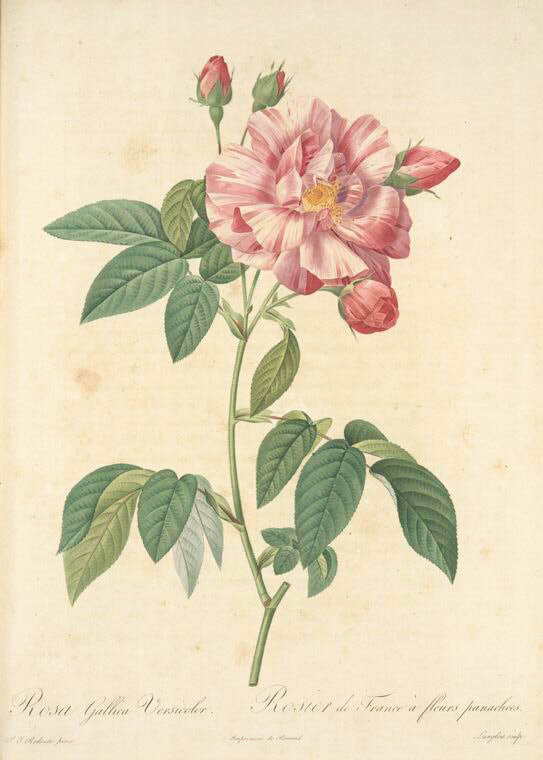 Redouté originally went to London and Kew in 1786 to learn the art of stipple engraving and color printing which was to provide him him with the technical expertise needed to produce his beautiful botanical illustrations. He later introduced "stipple-engraving" to France. ​Latterly, he certainly developed to perfection a method of colour application which involved the use of a minute chamois leather or cotton mop for the application of a succession of colours to a copper engaving. In later years, he also learned how to paint using pure watercolour - from a Dutch artist, Gerard van Spaendonck. or are providing giclee prints of the originals. One of the better examples are the Redouté prints by Joel Oppenheimer. I don't buy but I do enjoy looking! 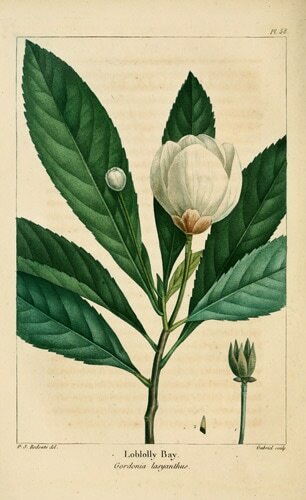 Camellia Japonica by Pierre Joseph Redout | Fitzwilliam Museum - It is interesting to note the very different surface effect of watercolour on paper as opposed to vellum. Teylers Museum | Nu te zien - Redout's Roses From 19 January to 5 May 2013T his exhibition is the first in the Netherlands to provide a variegated overview of his work, with, at its heart, the beautiful books that the Teylers Museum purchased immediately after their publication. Apart from Wikimedia Commons, the Biodiversity Heritage Libary and the New York Public Library, most of the onlines sites highlighting images are those selling reproduction prints by Pierre-Joseph Redouté. Some are much better than others. Some are the ONLY places online that you will see certain images of the less popular variety so I make no apologies for including them. 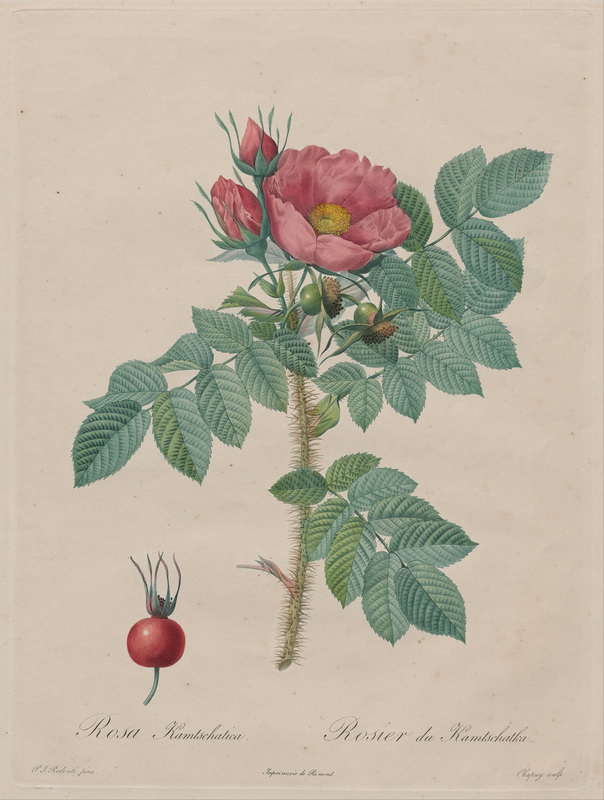 Artcyclopedia - Pierre Joseph Redoute Online ​Pierre Joseph Redoute [Luxembourgeois-born French Painter, 1759-1840] Guide to pictures of works by Pierre Joseph Redoute in art museum sites and image archives worldwide. Web Archive - Pierre-joseph Redoute (1759 - 1840) Artwork Images, Exhibitions, Reviews Artworks in Museum Collections: (40)Click the artwork titles to see actual examples of artwork or works of art relevant to works by Pierre-Joseph Redoute. ​This book was produced to accompany a survey and exhibition of Redouté works at the Teylers Museum in the Netherlands. The book is richly illustrated with a wide selection of his sketchbooks, drawings and watercolors.